There are many options for those who are in the market for a popcorn popper. Whether you want something to provide you with additive-free, plain popcorn or one that will provide you with a single-serving, plus much more, you can find any kind of machine that will suit your every popcorn need. This brings us to the TWOBIU Hot Air Popcorn Popper. This machine brings ingenuity and simple operation along with effective clean up to the table and is wildly affordable. Let’s take a look at the whole of what it brings to the table and see how it compares with others of the genre and if it is the right one for you! 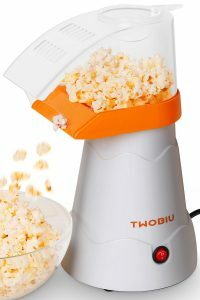 The TWOBIU Hot Air Popcorn Machine provides you with up to 16 cups of deliciously crispy popcorn in just 3 minutes, and does so without making a total ruckus. Customers rant and rave about this appliance in that it does a fantastic job at leaving little-to-no kernels behind and is much quieter than other popcorn makers. ¼ cup of popcorn kernels is an optimal amount of kernels to place in the popper in order to get a heaping bowl full of perfectly popped kernels. It is highly advised that you use as big a bowl as you can — preferably one that can accommodate up to 4 L/16 cups/4 QT — for when those fluffy, crunchy clouds of goodness come erupting out of the popping chute! Another great feature of this appliance is that since it uses hot air to heat the kernels you receive healthy, additive-free, preservative-free popcorn every time! Forget microwavable bags of popcorn and make your snack as plain and healthy, or sweet and salty as you like! Clean up with this popcorn popper is no more difficult than other brands or styles. It is equipped with a removable chute and measuring cup that fits neatly into the top of the chute, both of which can be cleaned in the dishwasher or by hand with warm, soapy water and a wet washcloth. As for the appliance itself, it is best to make sure it is unplugged when cleaning it and that it is away from any water (except for that which is in the damp washcloth of course). Use a damp washcloth and simply wipe down the interior of the popping chamber thoroughly to remove any leftover debris or oils so that it is ready to go for the next batch of popcorn! The TWOBIU is designed very efficiently and is family-friendly with it’s on/off switch and automatic “turn-off” feature. Many other electric popcorn appliances don’t feature the on/off switch and require that you plug and unplug the machine in order to activate the popping mechanism, however, with this appliance you can plug it in in order to preheat the popper and then flip the switch whenever you are ready to begin! It also is equipped with an automatic shut-down trait which is activated when the machine reaches 365 degrees, meaning that you don’t have to worry about it overheating and compromising the integrity of the appliance. It is recommended that considering these elements, you allow the popper 1 minute to cool down after popping before removing the chute and 2 to 3 minutes before beginning your next batch. Otherwise you may encounter the popper shutting down in the middle of your second load due to overheating. This popper also comes with a measuring spoon located in the top of the chute that allows for you to heat up butter, caramel, or any other toppings you wish to add to your favorite tasty snack during the heat process! Not only does it allow for you to heat your toppings, but it also closes off the top of the chute so you don’t have to worry about popcorn erupting out of the machine and exploding throughout your kitchen! 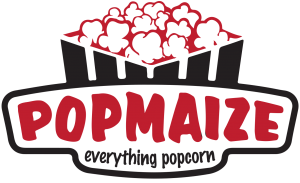 Considering the gleaming customer satisfaction and the affordable price of this product, you are getting a quality popcorn appliance for less than $50.00. What makes this a quality popcorn appliance? Well, it doesn’t shoot popcorn out all over the place, which seems to be a complaint and concern for many when purchasing a popcorn-specific appliance. It is also FDA approved and doesn’t use any harmful materials that may leave you slightly worried about your health. These traits accompanied by it’s easy clean-up, efficient on/off switch, automatic shut-down and affordable pricing make it a steal! The body of the popper is opaque-silver/off-white and is a cone-shape that narrows into the orange lip of the chute. As it narrows, the body features two terrace-like, wavy steps and features the name TWOBIU on the side right above the on/off switch. On the top you have the transparent, removable chute coupled with the measuring cup. All of this along with the power cord in the back of the appliance make it very simple and easy on the eyes. It is a great addition for any kitchen collection and is small enough that it will fit in any one of your cupboards without any extra fuss! Whether you are a college student in need of some study snacks or a mother looking for a healthier option for your kids’ favorite movie snack, this popper will not let you down and will leave you with a smile on your face! This popcorn machine is a brilliantly simple appliance that will make popping deliciously customizable popcorn a reality in your home. With it’s simple design, quality material, family-friendly features and quick-and-easy yield, you will not regret purchasing the TWOBIU Hot Air Popcorn Popper!